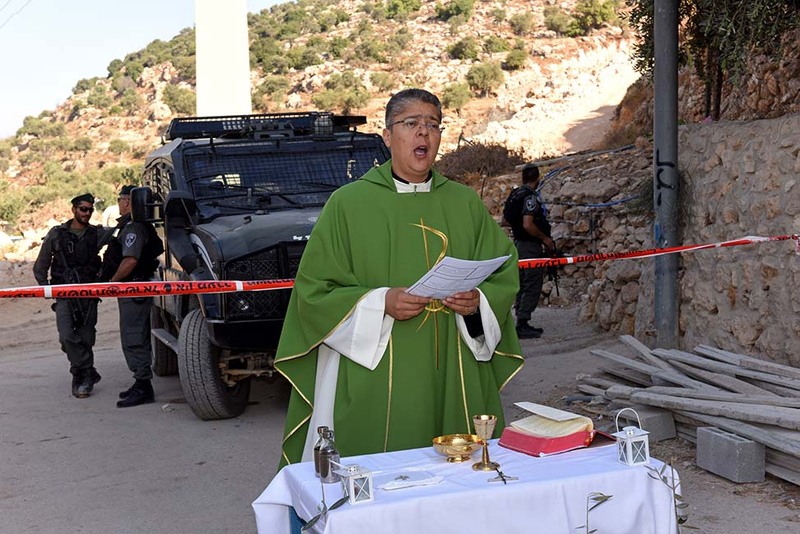 Since hundreds of olive trees were uprooted to make room for a separation barrier through the Cremisan Valley adjacent to this largely Christian village, Fr Aktham Hijazin, Annunciation parish priest, has been celebrating Mass daily behind red-and-white police tape. The tape – and the border police who patrol the area – prevent some 56 Palestinian landowners from reaching their land. A dump truck rumbles by, kicking up dust, just a few feet away from where the priest has set up his makeshift altar: a small table covered by a white cloth with three olive tree saplings at its base. On 6 September, as Fr Hijazin celebrated Mass for a handful of local landowners and a small Swedish group, the sound of the trucks occasionally drowned out their voices. Later, coughing slightly, the priest held up the consecrated Eucharist, first toward the worshippers, then facing the destroyed orchards. In April, the residents celebrated the Israeli Supreme Court decision, which seemingly blocked a plan to build the separation barrier. But just three weeks later the Ministry of Defense sent a letter to the private landowners’ attorney and the Beit Jalla municipality, announcing its intention to build the wall. Despite several legal appeals requesting to see the wall’s new route, the court declined to issue an injunction, and on 17 August bulldozers and tractors began uprooting hundred-years-old olive trees and clearing dirt paths. Attorney Raffoul Rofa, executive director of the Society of St Yves of the Latin Patriarchate of Jerusalem, who represented the Salesian Sisters affected by the construction, said a gap is expected to be left open in the barrier around the monastery and convent – at least initially – until a solution is devised to allow the institutions to remain in contact with the Palestinian side. Meanwhile, Palestinians say, Israel is creating space for more settlements while legal appeals are still in the works. A protest by residents during which they tore down a military gate closing off the land was met by tear gas and beatings on 23 Auust. Since then, local Christian leaders have been holding the daily Masses. Sometimes priests from the local Greek Orthodox and Lutheran churches join Fr Hijazin. With the olive harvest season just weeks away, the landowners were not even permitted to harvest the fruit from their trees one final time before they were dug up in August, he said. They have been told they will be permitted to harvest the olives from the remaining trees, but the landowners are unsure whether this will continue in the years to come. Though it is painful to see what has happened to his family’s olive orchard, Issa Shatleh, 43, said he comes to pray almost every day. Only two trees are left in his orchard – one excruciatingly out of reach just beyond the police tape and the other a few feet behind. “This is very terrible for us. The land has been in our family for hundreds of years, it is our main source for olives and oil. Now how are we going to go harvest just one tree even if they allow us to get there,” said Shatleh. He said he had not brought his elderly mother to see what has happened, but he did bring his three young children to show them what the soldiers were doing to their land – not to implant hate, but so they keep the trees in their memories. “This is our land, even if they destroy the trees and take the land, we still own this land and some day it will be returned,” he said. Nakhleh Abu Eid, 76, said the Israelis had destroyed 15 of the remaining 20 trees which had been left him following a previous land confiscation on another part of his family’s land. He said tries to instill in his teenage grandsons the tenants of Christian forgiveness to temper their anger and frustration, so they do not turn to violence. “I tell them we lost the land, we don’t want to lose them, too,” said Abu Eid.